The other night I was sitting with my Mum and she happened to go on Priceless Shoes, I think they were a highstreet store but then they closed down due to the recession, although after looking on their store finder they have a fair few shops in the Midlands. As Mum was flicking through I saw these these boots, Instantly remembering a VERY similar pair from Topshop that I actually bought and returned months and months ago because I thought the price was extortionate. For £10, I took my chances and ordered a pair. I did a quick google, YES I even remembered the name of the shoe, and they looked pretty much the same. They came today and I LOVE them! They don't feel too cheap or crappy either! I paid £10+ £3.50 P&P, compared to be £60 odd I'd paid for those Topshop ones. 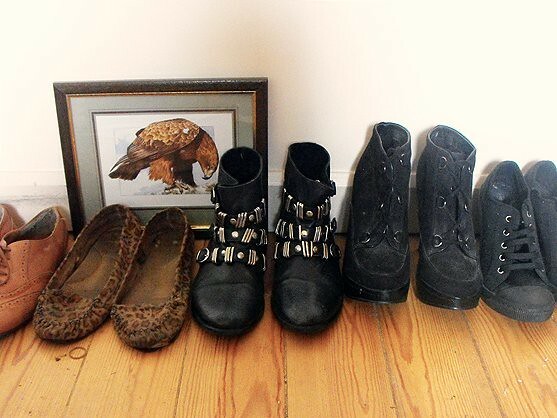 I tend to forget about discount shoe stores, I did buy an awesome pair of booties (2nd from the right) years ago from a random ebay shoe shop and I loved them! From experience, I tend to see alot of Topshop, New Look and River Island shoe-a-likes on eBay for much, much less than they are in stores. For example these boots on eBay are very similar, if not the same as these Topshop ones. These current stock River Island boots are very similar to these fur lined boots on eBay. Obviously the quality might not be the same and the designs may be a bit off, I cant vouch for these stores because obviously I've not bought these shoes. But hey, hope it helps some people who want some cheapy shoes! Although I'm tempted to get the Topshop Swallow cut out copies because after seeing Charlene in them, I really NEED them! Have you bought off any off these sorts of shoe shops before? Any good? Recommendations in the comments! It's not like they're going to be worn every single day, so I'd rather have loads of cheap shoes than only a few expensive ones! Thanks for posting these! in theory i always say u should get a pair that costs a bit more cos it will last longer etc vs 2 pairs of cheap ones. but in practice, i tend to go for the 2 pairs of cheaper ones!!! They look EXACTLY like the Topshop ones! I bought the Topshop ones last Autumn and I wore them to death. Literally, I wore them until they broke - which was about a month ago. Well worth the £65 in my opinion :) I prefer to get more expensive stuff if the quality is better. That's just me though. I had a pair of boots from priceless shoes that I paid just £6 for and I wore them all the time until the sole literally snapped in half! I LOVE ebay for stuff like that. i got a Topshop 'ambrose' esque pair in black off their for £20 from some shop called 'shoes2you' or something similar. They're not leather and they are currently wrecked on my heater from all the snow but they survived a good while. ebay FTW, i check there before i spend loads of money on the real thing. LOVE this pair, i wanted the pair in there for ages that were just like that but weren't ankle boots, more like brogues. I got the eBay version of the River Island fur boots....they're such good quality. I'm much happier to pay £18 on eBay than £45 in RI! i love the priceless ones! theyre so so cute and such a bargain! Really liking the shoes, I'm in need of some new shoes after mine are falling apart; i wear them in all seasons... even the snow! they've become so damaged! I'm not sure wheather to buy some pricey ones so they last longer... urm! Those swallow wedges are so nice! I bought some from topshop however the back of them is very strange, my ankle didn't fill the gap which was depressing so I had them returned. There's still a Priceless Shoes in Lichfield and in Birmingham! I'm pretty sure I saw one in Essex as well last week.. or could have been London. I love those boots, might have to get some as I have no black boots! Are they true to size? What a great buy, so beautiful too! Hope they last a long time, they are definitely a wonderful bargain treasure. I love cheap shoes! I buy expensive flat shoes because I walk a lot in them, but fashion shoes like heels I won't wear often I don't really like paying over the odds for. We have a shop here called 'shoemarket' which sells so many cheapo rip offs of Topshop shoes, it's great! Topshop shoes have gone WAY overpriced lately. I like buying shoes during sales, so that I get a great quality but at a cheaper price. Wow, these boots are amazing! There's still a priceless shoes in Glasgow, but I don't think I;ve ever been in .. I definitely need to take a wander in now! I bought a cream dress in Topshop for a christmas night out for around £50 after thinking ohh I'll never find anything as nice if I go to Primark .. then I walked in the next day and they had basically the same dress but in an empire line style (which would actually suit my shape better) for £18 or something grr! Thank you for the links :) just purhcased some pixie boots from the ebay site for £14.99 and I've been looking for a pair for ages!! Though I should be saving but they were on sale!! i'm very jealous, i love it when i find things like this in the most unexpected places! i was really happy with them. Those boots look pretty much identical to the Topshop ones! I always seem to look on eBay for shoes now as I just find them so expensive on the high-street. I live in the states and we have stores that sell a lot of lower priced shoes. We have one store that has tons of boots, and booties for $10 USD, or £6.30. The best part is no shipping. This boot is absolutely beautiful!!! love your blog, just new follower, do you want to follow my blog? I always try and wait to see if I can get items like this cheaper anywhere else, but 70% of the time I'm overcome with the impatience of wanting it there and then. I find it really hard to find something that looks the same, but cost less. I never want to put time in it haha. ow and nice shoes ofcourse! I nearly bought those boots when they were instore! Glad I had second thoughts :) Thanks for the tip! now i try and have as few pairs as possible and just buy one pair of flats and one pair of heels per season. having said that, the cheaper ones aren't always worse quality. i had a pair of £4 ballet flats that outlasted numerous pars by faith, office, new look, topshop etc. I have seen these shoes on topshop, too, and have been since then always thinking about buying them, but 60 pounds are just too much, especially for someone, who mostly wears high heels, like me. I love them tough. I think to buy cheap shoes is okay, especially when they are more or less 'in' at the moment. I only spend lots of money on shoes, which are made from real leather and for the only flat pair of shoes I wear, because if I wear them, I'm on my feet the whole day without a break and then you need a comfy pair of shoes. Sorry, this one's so long. Hey... cheap look a likies are the best. I bought a pair of timberland look a likies from Dotty Ps & at a fraction of the price they lasted forever! http://adriennestyle.blogspot.com/ check it. you're there! Lol! i just tried on the same black boots today! They were comfy but i can't spend no more...i shan't! I really like their boots though! Same with Internacionale. The stores have alot more variety. I've never really considered getting my shoes from ebay. I usually buy my shoes from places which have student discount and luckily Topshop does! I don't know what I'll do when I'm not a student anymore, haha.